Audioboom / "People didn't want to believe that a new, even more devastating war was coming up..." "Shanghai 1937: 3 of 3: Stalingrad on the Yangtze" by Peter Harmsen. "People didn't want to believe that a new, even more devastating war was coming up..." "Shanghai 1937: 3 of 3: Stalingrad on the Yangtze" by Peter Harmsen. “In the voluminous literature on World War II, few books treat the Sino-Japanese War, and few of those are accessible to non-specialists. Thankfully, seasoned East Asian correspondent Peter Harmsen has written an engrossing study that goes far to fill the gap in the historiography of a neglected theater of operations and the first large-scale urban battle of the war.” ―Michigan War Studies Review This deeply researched book describes one of the great forgotten battles of the 20th century. 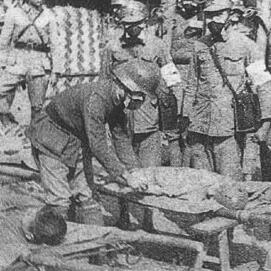 At its height it involved nearly a million Chinese and Japanese soldiers while sucking in three million civilians as unwilling spectators and victims. It turned what had been a Japanese adventure in China into a general war between the two oldest and proudest civilizations of the Far East. Ultimately, it led to Pearl Harbor and to seven decades of tumultuous history in Asia. The Battle of Shanghai was a pivotal event that helped define and shape the modern world. Actors from a variety of nations were present in Shanghai during the three fateful autumn months when the battle raged. The rich cast included China's ascetic Generalissimo Chiang Kai-shek and his Japanese adversary, General Matsui Iwane, who wanted Asia to rise from disunity, but ultimately pushed it toward its deadliest conflict ever. Claire Chennault, later of “Flying Tiger” fame, was among the figures emerging in the course of the campaign, as was First Lady Eleanor Roosevelt. In an ironic twist, Alexander von Falkenhausen, a stern German veteran of the Great War, abandoned his role as a mere advisor to the Chinese army and led it into battle against the Japanese invaders. In its sheer scale, the struggle for China’s largest city was a sinister forewarning of what was in store for the rest of mankind only a few years hence. It demonstrated how technology had given rise to new forms of warfare, or had made old forms even more lethal. Amphibious landings, tank assaults, aerial dogfights and most importantly, urban combat, all happened in Shanghai in 1937. It was a dress rehearsal for World War II―or perhaps more correctly it was the inaugural act in the war―the first major battle in the global conflict.